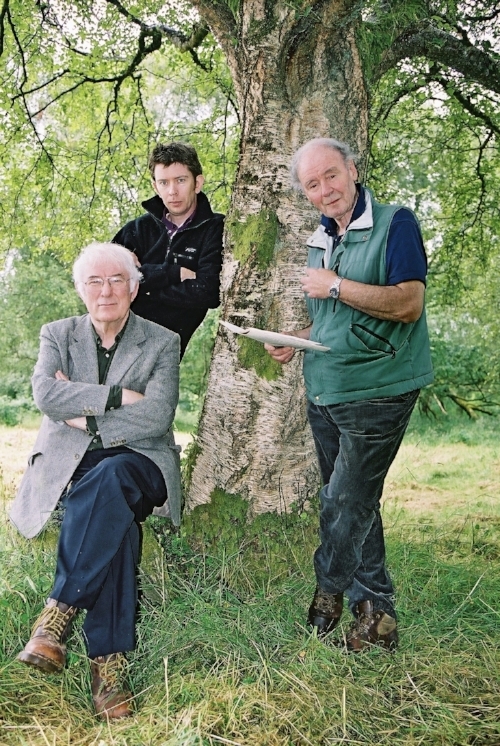 Seamus Heaney, John Kelly and David Hammond, 2003, photographed by Pat Lunny. It’s a tough poem for both poet and reader. The whole thing was dreamt and, true to the dream, Seamus hasn’t placed his friend with the Gods, or sent him to Valhalla or Tír na nÓg. Nor has he reached for Virgil or Dante to speak to David’s shade. Instead, all we have is darkness, silence and emptiness. I wish I knew the full meaning of that final image. It haunts me, and I regret that I never asked. David Hammond was, at various times, a schoolteacher, a BBC man, a film-maker and a Director of Field Day Theatre Company. He was also, at all times, a singer. It’s also how I remember him. The larks, the pranks, the preoccupations, the songs and the films were all, in their own ways, protests against the state of things. He was a passionate man – rebellious, egalitarian, resilient and utterly committed to holding the line for decency and goodwill. He saw possibilities where none seemed to exist and for those of us lucky enough to be around him, he was a bulwark against despair. David’s was a philosophy he’d inherited from his parents. His father was Church of Ireland and his mother was Presbyterian, from a family with leanings towards Home Rule. And although they had moved to Belfast from rural North Antrim in search of work, they had remained country people, never fully embracing the city. By their example, they instilled in the young David, not only a great love for local language and song, but also an open-hearted approach life in the north. Sometime in the early Forties, in what he often described as a “revelation”, David first read about the world of his parents in the work of the geographer E. Estyn Evans. School textbooks were filled with maps of English cities and the Amazon Basin but Estyn Evans was focussing on David’s home ground – on the very people and places his mother and father had talked about. And so, inspired by the riches right under his nose, David and a few friends began to cycle around Ireland armed only with bags of porridge. In 1956 he made his first visit to the United States, where he met Pete Seeger, Alan Lomax and Jean Ritchie. In Chicago, where he recorded an hour with Studs Terkel, he stayed with Big Bill Broonzy, spending time with the singer’s mother and aunt, both former slaves aged 105 and 107. Some years later, he met Liam Clancy for the first time at Jean Ritchie’s house on Long Island. The Clancys and Tommy Makem were about to become the most famous Irishmen on the planet and David joined them in places like The White Horse in Greenwich Village. Also in the room, soaking up the songs, was a future Nobel Laureate called Bob Dylan. Back in Belfast, working as a schoolteacher at Orangefield, singing songs like ‘Casey Jones’ to a classful of boys that included Van Morrison, David first began to appear regularly on the BBC, where he eventually took up a post as a producer. With the degree of authority that came with the role, and later as a film-maker, he was able to encourage and celebrate the local people he believed in, and literally transmit his love of the local place. At a time when the official tendency was to look elsewhere for confirmation, this was all radical stuff, and his maverick spirit made for a welcome change. Before long, people like Brian Friel – and Seamus – were contributing scripts to schools’ programming. I first met David outside the Broadcasting House, sometime in the late Eighties. I was on my way into work and he stopped me, introduced himself and said kind things about my radio programme. It was a welcome boost. Praise for my efforts were fairly limited inside Broadcasting House and, of course, he’d have suspected as much. He no longer worked there but he kept in touch with the place, and had the full measure of the people I was up against. By inviting me to visit the office of his company, Flying Fox Films, he was generously suggesting a much more salubrious milieu. In fact, he was throwing me a lifeline, and he knew it. Seamus described David as “a natural force masquerading as a human being. Halfway between a lord of misrule and a tuning fork” and I was in bad need of just such a pal. All the ‘scenes’ I’d known in Belfast had turned out to be traps – but here was liberation. Yes, I’d already been making my own small (and increasingly self-destructive) protests, but in David I saw a much better way. Thanks to him, I learned to move from frustrated stand-off against one thing, to participation in another – something that was full of possibility, decency and endless sport. Above all, here was a world where ‘being yourself’ was not only valued, it was compulsory. And the milieu was indeed salubrious. My first encounter with Brian Friel was when I answered the phone in the Hammond house, pretending to be David’s butler. When I realised it was Brian, I just had to hold my nerve and keep it up. As did he. Paul Brady and Arty McGlynn playing tunes in the kitchen is another night I’ll never forget. And David singing ‘The Hills Above Drumquin’ with his favourite line: Drumquin you’re not a city/ but you’re all the world to me. I’d already met Seamus in a signing queue and later in the stress of a BBC scenario, but it was only through David, in the relaxed circumstances of his home, that an actual friendship was made possible. Seamus had previously said nice things about poems I’d written and had, of course, already run me through his own personal scanner – but David’s imprimatur was no small thing. In fact it was at David’s suggestion that I made my first visit to the Heaney home which was, as you might imagine, a very special day. First we exchanged bits of Hammond lore at the kitchen table and then Seamus took me to the attic and showed me all the journals and ledgers. The attic. The second-last poem in Human Chain. After that we went to Sandymount Village where, in what might seem like a surrealist experiment, Seamus bought a lightbulb and a fish. Then a couple of pints in Gleeson’s of Ringsend and I went on my way, utterly blessed. Be assured I was never blasé about any of this. I knew exactly the company I was in and I appreciated the privilege. I especially loved it when when Seamus and Marie were in Belfast, and after all the crowds and queues at some literary event, we would all adjourn to David’s house for a more relaxed ‘aftermath’. In fact, during one late night gathering, in a rare performance, Seamus sang a song. In my memory it was his version of Marie’s party piece ‘Slieve Gallion Braes’ – although Neil Martin believes it was Sir John Suckling’s ‘Why so pale and wan, fond lover?’. Or it may have have been ‘The Boys of Mullaghbawn’. That some confusion exists is no great surprise – yellow whiskey, rather like ‘being yourself’, was also compulsory. And then there were the postcards. I regularly received, as did Seamus, Brian Friel and others, dispatches from assorted Orange Lodges, or from a mysterious woman called Sadie. What the postmen, especially any from a Loyalist background, made of my apparent relationship with the then Taoiseach is anybody’s guess – Best wishes for your driving test, love Albert Reynolds being a fairly typical message. I also got quite a few from Edwin Poots of the DUP. Head-shots of BBC presenters were another favourite. In fact, one of me turned up quite recently in the papers of Bill Cole – an editor at Knopf in New York who also happened to be the grandson of Jeremiah O’Donovan Rossa. Laminated airline safety cards were also sent through the mail, customised with speech bubbles coming from the mouths of passengers in the brace position. And airline sick-bags too. Boke bags, he called them. The rare ones he kept. The rest he posted. There was, of course, method in all of it. David was connecting people and then with infectious energy and humour was keeping the lines of communication open. It was important to him. In his own subversive, unshackled and joyous way he was keeping things going. He was keeping us going. In a place where the talk is often of division, and where culture itself can be split into two camps of us and them’uns, David always gave good example by being resolutely his own man. Seamus called him “a one-man peace process”. He was easy with everyone and threatened by nobody. He chipped into tribal defences and encouraged people to share, enjoy and celebrate the best of each other. Like his parents before him, he had a vision of what life could be like and he devoted his own life to pursuing it. He was a rare and mighty force for good. He was also my dear friend, counsellor and co-conspirator and I’m a lucky man to have known him. He changed my life. I treasure the memory of every night spent in that house in Cregagh with himself and Eileen, and I marvel at how fortunate I was to have been in such company. David is ten years gone this month, Seamus five, and I miss them both very much. I sometimes think of them laughing together and raising a glass. It’s always outdoors, in a wide open space. It could be farmland in north Antrim or County Derry, or maybe it’s a field above a beach in west Donegal. It might even be, athough the poem gives me no such permission to picture it, an overgrown airfield in the brightest sunshine of late summer. John Kelly is a writer and broadcaster. Notions, his first collection of poetry, is published by Dedalus in October 2018. Hammond: Duais an Dorais/A Parting Gift, a documentary about the life of David Hammond, will air on BBC1 Northern Ireland on 26th August at 10pm and on TG4 on 29th August at 9.30pm.